Favorite Music: Yui doesn't follow any particular style, and isn't picky. As long as she likes it, anything is OK.
Family Structure: Family of four, both parents and younger sister (Ui). Father works for a trading company, gets a lot of overseas assignments and tends to be absent. Because the mother often travels overseas too (helping the father), the daughters have many opportunities to spend time alone together. Dwelling: Single family detatched home. Preferences in clothing: Pants over skirts. Yui is relatively fashion conscious and likes styles featured in teen magazines. She also wears casual clothes such as shorts and T-shirts at home. Her room: Clean, because Ui cleans it. Yui likes small cute things, and keeps stuffed toys and such in her room. The room is painted in girly pastel and pink tones. Favorite food: Anything, as long as it's sweet and delicious. Subjects she is good at: Between low and average and can rarely pass test easily, but has a hard time with questionaires. Physical exercise: She can do it, but hates getting tired. Way to pass time when alone: Lazing around at home. Main character, guitarist, lead vocalist. Having misunderstood that "light music" equals "easy music" (like whistling), she joined the Light Music Club and picked up guitar with absolutely no prior experience. She is the type of person who doesn't read manuals and relies on her own intuition and self taught approaches. Yui is a girl who's easily distracted by cute things and tasty food. She's a crybaby but cheers up easily if she gets some sweets. She eats a lot of sweets but she does not gain as much as she eats, she said to herself. In many ways some may say she's a child, and making sure she practices is a problem. When Yui takes good care of something, like her electric guitar- Gitah, she sleeps with it, plays dress up with it, and even also have tea time with it. When she wants to remember something, she forgets everything else. Yui's energy seems to come from cake. She is a clumsy, scatterbrain but optimistic and kind-hearted. Yui gets good grades in school but is easily distracted by trivialities. She has her younger sister Ui, who is very mature and acts as the "older sister" of Yui, to take care of her and keep herself in line. She has a very easy-going nature, but has incredible concentration when hyped, though this is only limited to 3-4 subjects at a time. 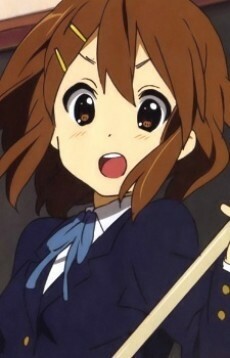 Despite all her flaws, Yui is still a fundamentally good-hearted girl who openly expresses love with hugs, holding hands and adorable nicknames (most notably "Azu-nyan" for Azusa), and once devoted to something she is loyal to a fault, and can display near-genius levels of competence to the subject of devotion, as shown by her perfect score in the makeup exams to return to the band. She has perfect pitch and thus can tune her guitar by ear flawlessly. She is the group's main vocalist, although she is known to forget her lyrics in mid-performance, as well as overdoing things, making her unable to perform sometimes. She is the sort of person who learns by being shown, rather than by having read about it. Yui shows this lack of technical knowledge when she does not know what a palm mute or vibrato is when Azusa suggests the use of one when teaching her, but could use one in her music.